Campari and soda are perfect together. Campari is a bitter, sweet and sour liqueur characterized by its dark red colour. This interesting liqueur is an alcoholic apéritif created from the infusion of select herbs and fruit in a alcohol and water bath. The concentration of alcohol in this aperitif varies from country to country, and can be found in some places as low as 20% to 28% alcohol by volume. A few signature cocktails use Campari. The aperitif is also commonly served with soda water, wine, or citrus juice. Spritzers and the Negroni are some of the more common cocktails employing this liqueur. The history of Campari began in 1860 with its invention by Gaspare Campari in Novara, Italy. The Campari Group, a multi-national company based in Italy, is the sole producer of this aperitif. Campari and Soda is a very refreshing drink, and typically served before a meal. Where did Soda Water come from? In 1767, Englishman Joseph Priestley invented carbonated water when he first discovered a method of infusing water with carbon dioxide. Legend has it Joe made a few key observations after suspending a bowl of water above a beer vat at a local brewery in Leeds, England. The air blanketing the fermenting beer (called ‘fixed air’ in those days) was known to kill mice suspended in it. Priestley found water treated in this ‘fixed air’ had a pleasant taste, then offered it to friends as a cool, refreshing drink. In 1772, Priestley published a paper entitled ‘Impregnating Water with Fixed Air’, in which he describes dripping sulphuric acid onto chalk to produce carbon dioxide gas. His paper then went on to discuss encouraging the gas to dissolve into an agitated bowl of water. Complicated, but it was a process that worked. In the late eighteenth century, the watchmaker and amateur scientist JJ Schweppe (1740–1821) developed a process to manufacture carbonated mineral water. His process was based on that discovered by Joseph Priestley. JJ then founded the Schweppes Company in Geneva in 1783. In 1792 he moved to London to develop the business there, and now we enjoy soda water on it’s own, or in various interesting cocktails. The coffee and cream cocktail, Smith and Kearns, is an interesting use of soda water. Italians have since made the most of soda water with their classic Italian sodas. 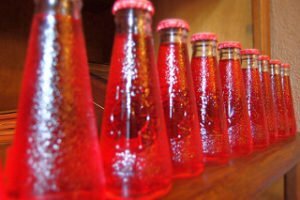 To make a soda, syrups are created from different fruits, then mixed with carbonated water. Go to Italy and treat yourself to a Campari and soda. Buy these tiny bottles in a 6 or 8 pack, because you will drink them all!